The data for this image were gathered by the Gemini South telescope — an eight meter monolithic mirror telescope of exceptional optical quality — using one of its primary instruments, a multi-object spectrograph in its imaging mode, serving as a camera. The primary galaxy in the image (NGC 6872) exemplifies what happens when galaxies interact and their original structure and form is distorted. When galaxies like these grapple with each other, gravity tugs at their structures, catapulting spiral arms out to enormous distances. In NGC 6872, the arms have been stretched out to span hundreds of thousands of light-years—many times further than the spiral arms of our own Milky Way galaxy. 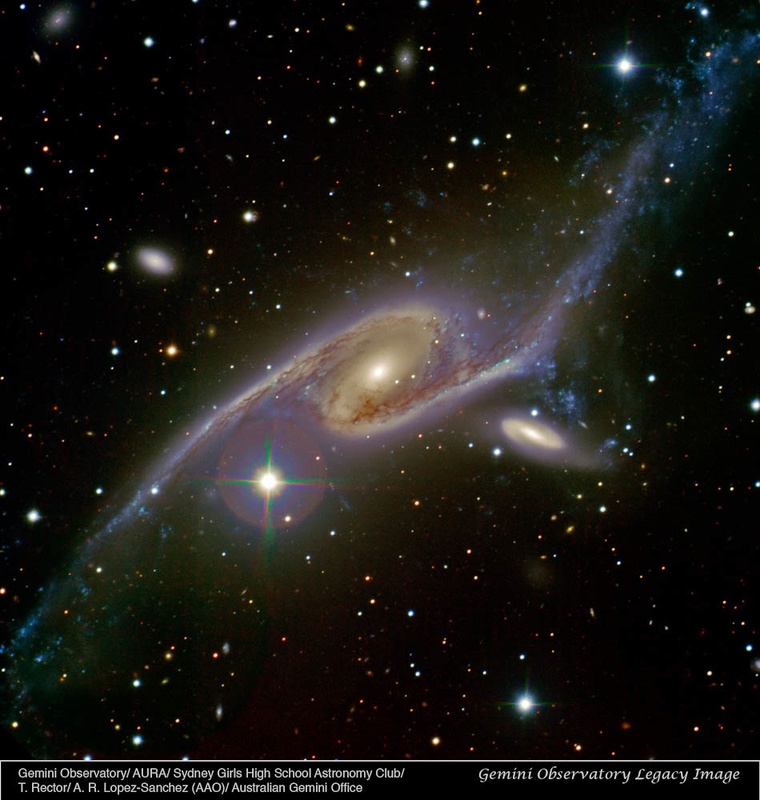 Over hundreds of millions of years, NGC 6872’s arms will fall back toward the central part of the galaxy, and the companion galaxy (IC 4970) will eventually be merged into NGC 6872. The coalescence of galaxies often leads to a burst of new star formation. Already, the blue light of recently created star clusters dot the outer reaches of NGC 6872’s elongated arms. Dark fingers of dust and gas along the arms soak up the visible light. That dust and gas is the raw material out of which future generations of stars could be born. So, who cares if our current politics is a social-engineering test-to-destruction experiment? In galaxies far, far, away, they’re getting ready to restart the tape and try again. You may consider this a cosmic open thread. *For more images of colliding galaxies — surely some of the coolest objects in the sky — check out this collection of Hubble images. This entry was posted on March 31, 2011 at 8:50 am and is filed under astronomy, Cool Images. You can subscribe via RSS 2.0 feed to this post's comments. From stardust we are born, and to stardust we will return. There’s something wonderful about that; we are nothing more than a passing moment yet we are also timeless.